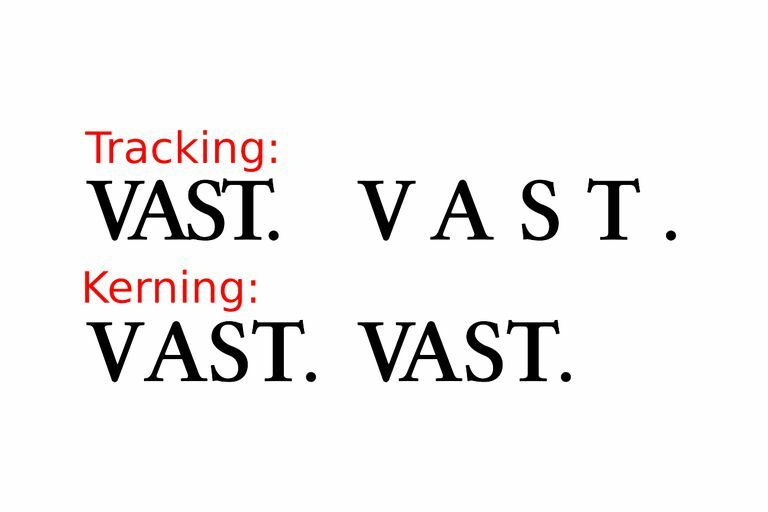 Kerning and tracking are two related and frequently confused typographical terms. Both refer to the adjustment of space between characters of type. Kerning is the adjustment of space between pairs of letters. Some pairs of letters create awkward spaces. Kerning adds or subtracts space between letters to create visually appealing and readable text. Kerning information for many commonly kerned character pairs is built into most quality fonts. Some software programs use these built-in kerning tables to apply automatic kerning to text. Each application provides varying amounts of support for built-in kerning information and may support only Type 1 or only TrueType kerning data. Anywhere from 50 to 1000 or more kerning pairs may be defined for anyone font. A handful of the thousands of possible kerning pairs are Ay, AW, KO, and wa. Headlines usually benefit from kerning, and text set in all caps almost always requires kerning for best appearance. Depending on the font and the actual characters used, automatic kerning without manual intervention may be sufficient for most publications. Tracking differs from kerning in that tracking is the adjustment of space for groups of letters and entire blocks of text. Use tracking to change the overall appearance and readability of the text, making it more open and airy or denser. You can apply tracking to all text or selected portions. You can use selective tracking to squeeze more characters onto a line to save space or prevent a few words from carrying over to another page or column of text. Tracking often changes line endings and shortens lines of text. Tracking can be further adjusted on individual lines or words to improve hyphenation and line endings. Tracking should not replace careful copy fitting. Use tracking adjustments carefully and avoid extreme changes in the tracking (loose or normal tracking followed by a line or two of very tight tracking, for example) within the same paragraph or adjacent paragraphs. In addition to the standard kerning and tracking methods found in word processing and desktop publishing software, some programs allow additional adjustments. For example, QuarkXPress allows the user to edit the kerning tables. This lets the user improve the kerning information in a font or add new kerning pairs so that manual adjustments are minimized for other occurrences of a kerned pair as it is repeated throughout the document. Users can permanently customize the kerning information for a font using a font-editor kerning utility. However, this can cause variations in the appearance of the text when the document is shared with others using the same font but not the customized version. Custom kerning data is preserved when fonts are embedded in an Acrobat PDF document. Kerning and tracking can be applied to text to create special text effects for headlines, subheads, newsletter nameplates, and logos. Exaggerated tracking can produce an effective and eye-catching title. Extreme kerning or over-kerning creates special effects with tightly spaced or overlapping characters.